A towering pagoda dwarfs a monument celebrating the sense of national unity enshrined in the Panglong Agreement, but the story doesn’t end there. PANGLONG, Shan State — Last month, I made my first pilgrimage to the Panglong monument, an obelisk commemorating the historic Panglong Agreement that Burma’s national hero Aung San and a handful of ethnic leaders signed in 1947. Along the way to the small town that is the accord’s namesake from Taunggyi, Shan State, my excitement at the prospect of seeing the monument began to build. Since childhood, we are taught the Panglong Agreement’s importance as a cornerstone of modern Burma, helping as it did to smooth the way for independence less than a year after its signing. I believe that like myself, many Burmese would want to visit the monument, if for no other reason than to look upon what was meant to be physical embodiment of the long-sought but never realized “Union Spirit” that the Panglong accord championed. For my part, I hoped that the three-hour drive would be worth it. I imagined myself not only feeling aesthetic appreciation for the stone pillar, but also gaining a greater sense of the comity that brought together Aung San, a member of the ethnic majority Bamar, and the ethnic minority signatories of Panglong. I was utterly mistaken, and disappointed from the moment I arrived at the site of the monument. It was not because the monument was of a more modest scale than I’d envisioned, however. Rather, the source of my negative reaction was a pagoda that was built right in front of the historic monument. As someone born in a country known as “The Golden Land” for its innumerable pagodas, temples and statues of Buddha, I scarcely find myself disappointed—or surprised—to see a pagoda anywhere. But this pagoda, towering over the Panglong monument, was different. From the main road a view of the latter, which stands at just over a dozen feet, is obscured entirely by the pagoda. “Who built this pagoda?” I asked my ethnic Shan friend who lives in Panglong and accompanied me, as our cab drove into the pagoda compound to reach the monument. “Khin Nyunt built it,” my friend replied. He was referring to a leading member of the bloody 1988 coup, Burma’s former powerful spy chief and prime minister under the previous regime. Khin Nyunt, who was eventually sacked in 2004, was known as Burma’s “prince of evil” for the leading role he played in clamping down on pro-democracy movements over the years, mostly by using lengthy prison sentences for pro-democracy activists and students to stifle dissent. My friend said the pagoda near the Panglong monument was a replica of Shwedagon in Rangoon, the most famous Buddhist shrine in Burma. Immediately, questions crept into my mind: Why did the previous regime build that pagoda smack-dab in front of this important monument? Was that site the only place to build that pagoda in this town, where even today there is no shortage of vacant land? I began unknowingly re-envisioning the landscape around the monument in my head, not only for me but also for Panglong’s residents and anyone who had previously visited or would in future make the effort to visit. This should have been a place with a sprawling promenade or well-manicured gardens, unfolding from the main road to the base of the monument. 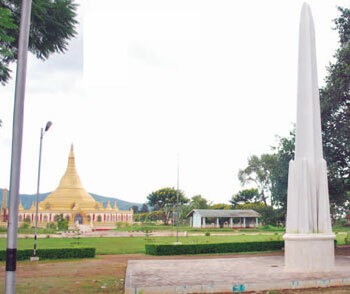 With the majestic mountains of Shan State as backdrop, it would not have been difficult to make this space a welcoming one; a public park perhaps, with this small but politically and culturally significant stone pillar as it focal point. When I shared these thoughts with my Shan friend, who is an artist and a devout Buddhist like most Shan, he said some people in the town wished the pagoda would vanish. The main reason for this kind of thinking is rooted in our country’s old political system, dictatorship, which was imposed by the late strongman Gen. Ne Win in 1962. In the decades since, ruling generals called all the shots. No matter was too small to be undeserving of their dictates, with the people’s desires at best an afterthought. There is every reason to believe that the case of this pagoda was no different. While researching the pagoda later, I found a 2009 report that called it Maha Rahtarbhithamaggi, meaning Great State Unity. SWAN said that the junta was attempting to “erase ethnic culture, religion and history of the country,” adding that 20 replicas of Shwedagon Pagoda were built by the junta in Shan State along. Indeed, there are many reasons for Shan people, like other ethnic minorities, to be furious about the previous regime’s deliberate and insensitive cultural and historical encroachment in ethnic areas. In 1991, three years after the previous military regime staged its coup, it ordered the demolition of the historical and beautiful Kengtung palace. Three years later, a modern hotel was built on the site, over the objections of local monks and laypeople. Its original name was changed to Kyaing Tong Hotel. Burma’s “prince of evil” that day said the pagoda was being built at the order of junta supremo Than Shwe, whose stated intention was for the shrine to strengthen the union spirit. To build the Panglong monument, it was the national leader Aung San who donated 1,000 kyats (quite a valuable sum at the time) on behalf of the Anti-Fascist People’s Freedom League. While we’ll never know what he might have thought about Maha Rahtarbhithamaggi, it’s safe to say that he would not have condoned the use of religious sentiment or structures as a tool to subjugate a culture or history. The replica of Shwedagon Pagoda not only blocks the view of the Panglong monument; it is an affront to the very Union Spirit forged by Aung San and his ethnic minority countrymen.